Today is International Blue Beanie Day. 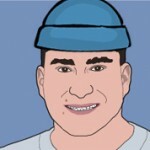 I’m showing my support for Web standards by adding a blue beanie to my avatar today. If you would like to add a beanie to your avatar, grab this Photoshop file created by Kevin Cornell. This video is a very good introduction to the topic. Jeffrey Zeldman really led the charge of this movement with his book Designing with Web Standards. Why I use Web standards? Almost every professional industry starts with standards. They are agreed upon best practices and principles that all the players in an industry follow. It makes for a common language and allows multiple people to collaborate. Back before Web standards, different browser vendors would implement HTML differently. It was hard for a designer to build a Web site that would function well across many browsers because the rules would always change. Now there is a common environment that we can build upon to make great experiences for the Web user. Quicker and easier development and maintenance – Using structured and semantic HMTL and CSS makes it a lot easier to understand code that was written by me or by someone else. I often have to revisit code that I wrote a year earlier. I can quickly get in and make my edits because I understand what I was doing in the past. I can also figure out what others were thinking when they coded their pages so I can learn from them or contribute to their work. It is forward thinking – Using standards future proofs your site for changes in the browsers. Standards gives you a solid foundation which will keep your site from breaking and allow you to implement new code and features as they are implemented in the browsers. Leaner pages – Separating content and presentation allows for less coding on your individual pages. I was able to cut the code on one legacy site down to a third or fourth of what it was when it was coded with tables for layout. Leaner pages load quicker which is a win for your visitors. Better accessibility – Using semantic HTML makes it easier for assistance devices to correctly interpret content. It also makes it easier to develop different versions of your site for different devices including mobile. You just serve up a separate stylesheet to each device. Highly adaptable – Separating presentation from structure makes it much easier to update a design or apply a new design because you only update one or more CSS files to update instead of updating code on every page. It saves time and money – This is the major business case for using Web standards. Leaner code means less bandwidth which saves money. Semantic code can improve your search engine rankings. It takes less time to develop and maintain Web sites using standards which saves the site owner money. I am joining other professionals in my industry in using agreed upon guidelines – Using standards makes it easier to work with others in my profession. We speak a common language and can contribute and collaborate with one another because we are committed to the same standards.